That feeling is back for Khawaja. 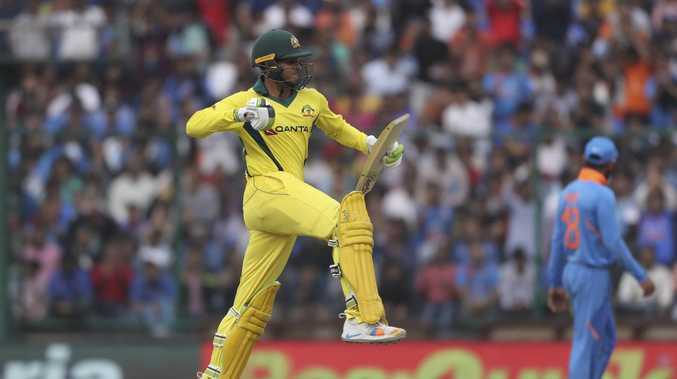 Australian batsman Usman Khawaja's irresistible form for Australia in India has him "locked and loaded" for a World Cup tilt. After a horrible run of form throughout the summer - where he bookmarked the season with hundreds but produced very little in between - Khawaja has burst back into form in India. Khawaja hit an incredible century in the UAE to save a Test match against Pakistan but didn't reach triple figures again until his final innings of the season against Sri Lanka at Manuka Oval. In fact, in eight innings against India, he passed 50 just one time. Khawaja said the arrest of his brother days before the first Test against India took its toll on his form. But the poor scores saw the knives come out. Ian Chappell backed Australia to leave him out of their Ashes squad and Shane Warne was quick to pounce on his flagging World Cup chances despite a fifty in the first match of the series. "I don't think Khawaja is the answer at the top of the order, I think D'Arcy Short is a better risk than Khawaja," Warne said. "He's got his bowling as well, Khawaja doesn't offer you anything in the field either, he takes too many balls at the top of the order." Khawaja's ears must have been burning. 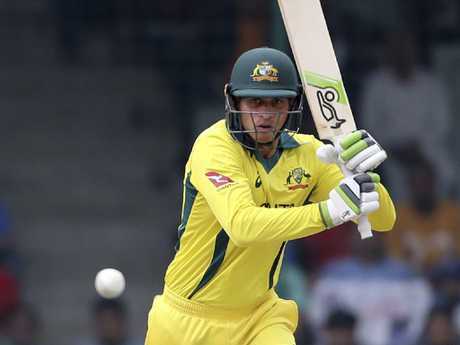 Since Warne's call before the second match, Khawaja has carved out his first two ODI centuries and a 91 to hit 383 at 76.60 in the five-match series. Having only hit 583 runs in the 21 innings before this series, it's a stunning arrival in white-ball cricket for Khawaja. Former Australian quick Brendan Julian said Khawaja was a lock for the World Cup side after this performance. "There is no doubt he's batting with a lot of confidence," Julian told Fox Cricket. "He's locked and loaded now for the World Cup. He might have been on the edge but the hundred the other day and this one now, he's done and dusted." Brett Lee agreed, putting him somewhere in the top order. "The thing about Khawaja is that he is batting with the right tempo now, he's limiting the amount of dot balls that he's taking to get off the mark," Lee said. "He got plugged in the first couple of games, fixed it up in the last two and he looks in decent form." Ian Healy reminded the pair that some players will have to miss out with Steve Smith and David Warner still to return, meaning selectors will have a tough time. He even showed some of Matthew Hayden's bravado, charging at the world's no. 1 ODI bowler Jasprit Bumrah early in his innings, although he only took a cheeky single. For Healy, it's a sign Khawaja is back. "This innings was magnificent," he told Fox Cricket. "His down the ground timing is back, and he's been able to hit the spinners. He took it to Kuldeep (Yadav) and hit him a couple of times for six. His pull shot is his trademark and it was on show. The cover driving - I haven't seen him cover drive the quicks as well until he got out to it. Usman Khawaja has been the hero of the Australian batting line up in India. "That's exactly what he needs and the team needs, some confidence and security at the top of the order. They just need to get Finch going." Healy also praised Peter Handscomb, who was under-fire but hit a century and a fifty in the series. He said Handscomb performed his role in the Australian side well "when the spinners are on, he can look reasonably comfortable - even the Indian commentators were impressed with his intensity today".